The purpose of this CCNP GNS3 lab is to gain a better understand of how to configure EIGRP on Cisco IOS routers. 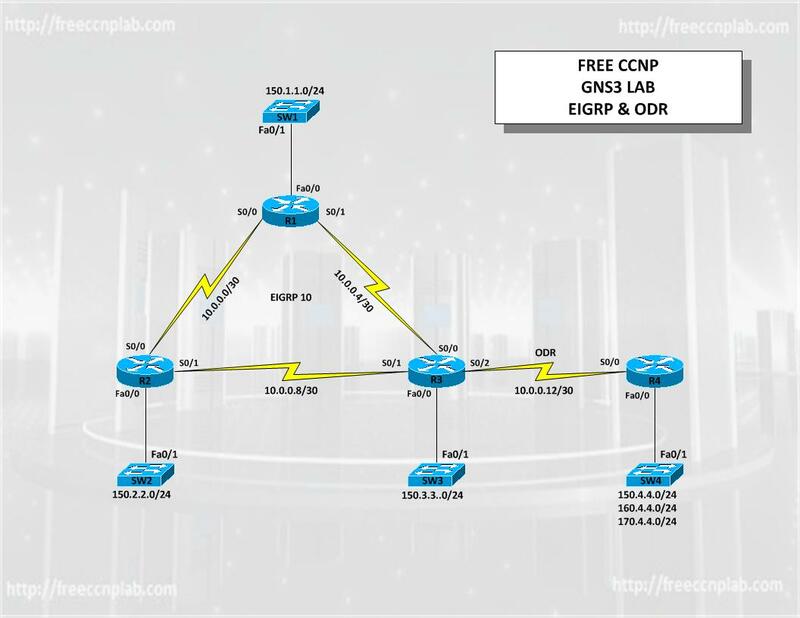 In this lab we will use GNS3 to model a simple lab to demonstrate how to configure and verify a basic EIGRP implementation. Additionally we will learn to configure basic ODR, redistribution and path control. EIGRP (Enhanced Interior Gateway Routing Protocol) is an advanced distance-vector routing protocol that permits routers to exchange Path information in a more efficient way than with previous network protocols. EIGRP grew out of IGRP (Interior Gateway Routing Protocol) EIGRP or IGRP can interoperate because the metric used with one protocol can be translated into the metrics of the other protocol. EIGRP, a router maintains a copy of its neighbor’s routing tables. If it cannot locate the route to a destination in one of these tables, it queries its neighbors for a route and they in turn query their neighbors until a route is found. When a routing table entry changes in one of the routers, it notifies its neighbors of the only the changes unlike previous protocols that require sending the entire routing table. To keep all routers aware of the state of neighbors, each router sends out a periodic “hello” packet. A router from which no “hello” packet has been received in a certain period of time is assumed to be inoperative. EIGRP uses the Diffusing-Update Algorithm (DUAL) to determine the most efficient route to a destination based on cost. A DUAL finite state machine contains decision information used by the algorithm to determine the least-cost route. ODR (On Demand Routing) allows routing information from hub/spoke topology to be exchanged with hub and entered into hub routing table without running any standard routing protocol. ODRis intended to be used in a partially meshed network where a hub router has one connection each to several spoke routers. Therefore, for any spoke to communicate with another spoke, such traffic must be routed through the hub. If each spoke networks is simply made up of the single router and multiple hosts. There is no need to run any routing protocols on the spoke since all host are connected and the routes can be exchanged with hub router using ODR. Hub will therefore install the routes in routing/forwarding tables as connected routes with next-hop address of each stub respectively. ODR uses CDP protocol that runs, by default on all cisco devices. CDP is used by cisco devices to learn & retrieve basic information about their connected neighbors. Therefore, disabling CDP on a router will also disable propagation of ODR traffic. ODR ip prefixes information can be redistributed to other routing protocols on the hub router using redistribute command. CDP (Cisco Discovery Protocol) is mainly a Cisco protocol and it’s primarily used to obtain the protocol addresses of its neighboring devices and also to discover the platform of those devices. CDP runs only over the data link layer enabling two systems that support different network-layer protocols to learn about each other. Enable EIGRP on Cisco IOS routers. Path control using EIGRP metrics. Verify EIGRP configuration using Cisco IOS commands.